Opening in the East Gallery on February 25 is Fresh Paint, a group show by Bay Area Contemporary Plein Air Circle (BACPAC), a group of artists dedicated to the pursuit of painting outdoors. 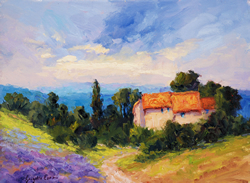 Each artist pursues his or her own development and artistic goals, yet all are united by a deep reverence for nature, a commitment to the artistic expression of representational painting, and the pursuit of a style derived from the Russian Impressionists, the Barbizon School, and the California Plein Air School. Some members of this group have painted together since 1992. Some paint together regularly three times a week. Exhibiting in “Fresh Paint” are Selora Albin, Randy Blasqez, Joyce Converse, Brigitte Curt, Marcia Enns, Kim Holl, Susan Lawson, Karen Leoni, Morning Nichols, Jim Smyth, Mary Stahl, Linda Stanley, Alice Weil, Karen White, and Tonya Zenin. 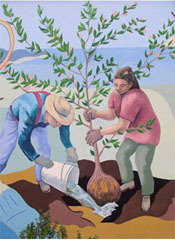 Members of BACPAC have exhibited in solo and group shows throughout the Bay Area. 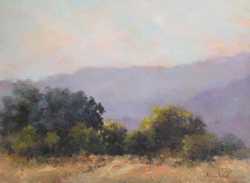 Last spring six members were included in a show at Filoli Center in Woodside, California. Sanchez Art Center is located at 1220-B Linda Mar Blvd., Pacifica, CA, 1.5 miles east of Highway 1, in the building with the colorful mural. Following the February 25 opening from 7 to 9 pm, galleries will be open Friday, Saturday, and Sunday from 1 to 5 pm, through March 27.